As I mentioned in the first installment, I won’t be covering every aspect of this trip with this report. After flying to Bali we stayed at the St. Regis Nusa Dua and W Seminyak, and then we flew Cathay Pacific business class from Bali to Hong Kong. So that’s where we’ll pick up. We had an overnight layover in Hong Kong, as we were arriving from Bali at around 8PM, and continuing the following day to London at around 3PM. So we needed a hotel for one night. In looking at the options, it occurred to me that I had an IHG free night certificate expiring in a couple of months. Just for having the IHG® Rewards Club Premier Credit Card (which has a $89 annual fee) you receive an annual free night certificate valid at just about any IHG hotel. That most than justifies the card’s annual fee, given that a vast majority of IHG hotels retail for over $89 per night. 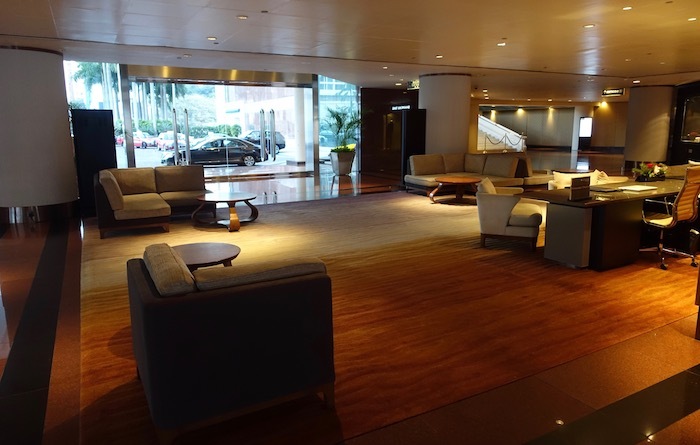 We were booking only a couple of days in advance, and they have availability at one of InterContinental’s flagship properties, the InterContinental Hong Kong. 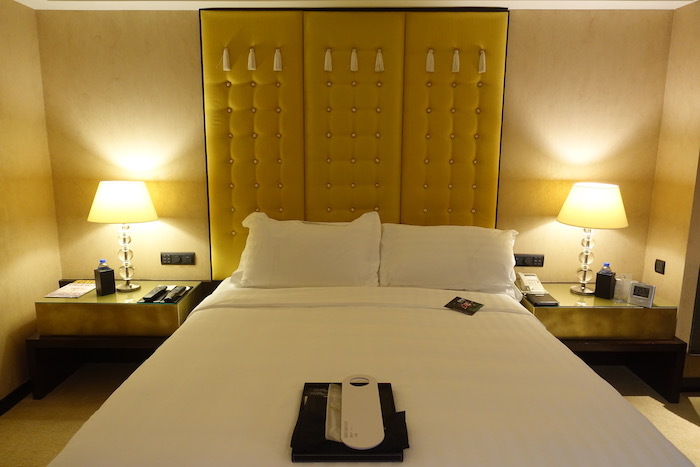 I reviewed this hotel eons ago, back when I was a Royal Ambassador member with InterContinental, while in this case I was returning as “just” an IHG Platinum member. The paid rate at this hotel would have been ~$326 including tax, which is actually on the low end for this hotel. However, my real out of pocket for the stay was $89 thanks to theIHG® Rewards Club Premier Credit Card. We took a taxi from the airport, which took about 30 minutes, thanks to the fact that we were arriving fairly late in the evening. 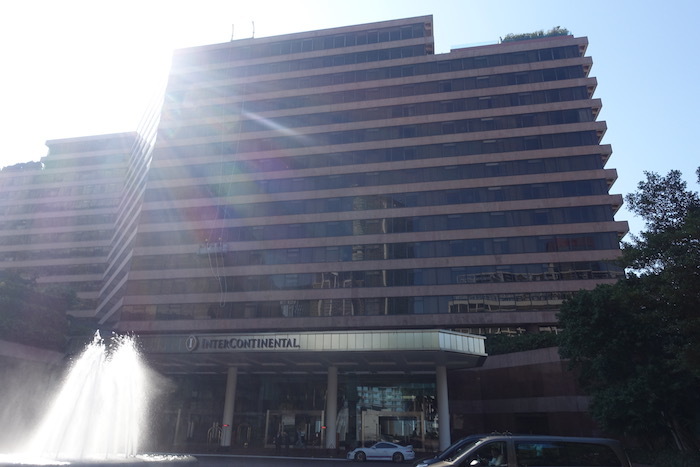 The InterContinental’s exterior is pretty bland, and looks like it could be an office building. As we pulled up at the hotel we were assisted by the bellmen and directed to reception. The reception desk was located directly ahead of the main entry doors. We were helped by an associate immediately, and he informed us that we had been upgraded from a superior room to a deluxe room (whatever that means). Having stayed at the InterContinental before, I know there’s one thing that makes this hotel special — the views. The hotel is known for its views, so you’ll want to do everything in your power to stay in a harbor view room. I asked how much it would be to upgrade to a harbor view room, and was informed it would cost 400HKD (~$50). It might seem silly to spend that much for a view upgrade on an overnight stay, but I thought it was well worth it (as you’ll see in the below pictures). 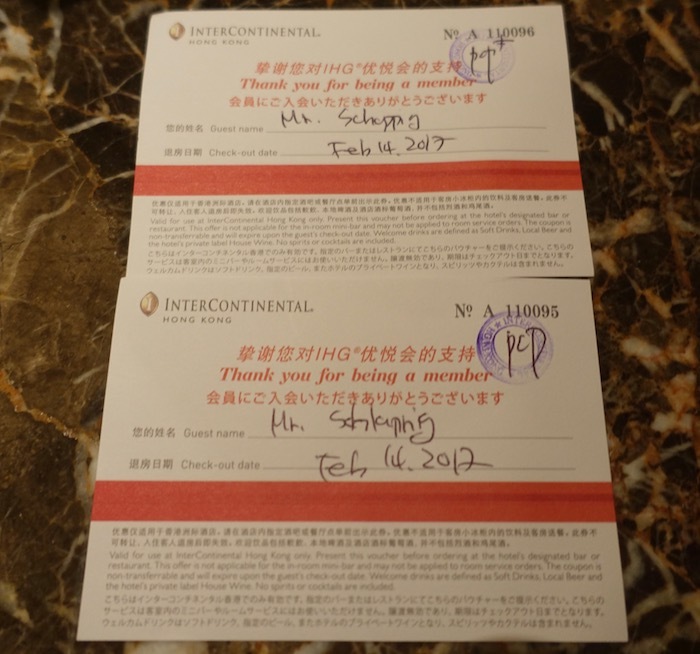 For being an IHG Rewards Club member I was also given two drink vouchers for the bar, which we didn’t have time to use. We had been assigned room 1022, so took the elevator up to the 10th floor. Okay, I’ll admit we were exhausted at this point, but it took us a good five minutes to find our room. It’s not like room 1022 is right by the elevator, so it’s rather puzzling that they don’t list it on the sign. Our room featured an entryway with a mirror on the right and the bathroom on the left. The room itself was beautiful, though I’d say felt slightly dated. I don’t think that translates in the pictures, as the pictures mak the room look nicer than I recall it being. However, for what we were paying and for a quick overnight, this room was great. Across from that was a console with a flat screen TV, as well as a desk with a comfortable office chair. The desk was actually a legitimate office desk, which aren’t as common in hotel rooms as they used to be. On the desk was a free smartphone you could use for the duration of your stay to make calls, tether off of, etc. Many hotels in Hong Kong seem to have this feature, and it’s something I really appreciate (though it’s not quite as useful to me as it used to be, given that I now have T-Mobile). Then by the window was a daybed of sorts. Back near the entrance was a tea set and kettle, as well as the minibar. Also waiting on the table was a small fruit plate. 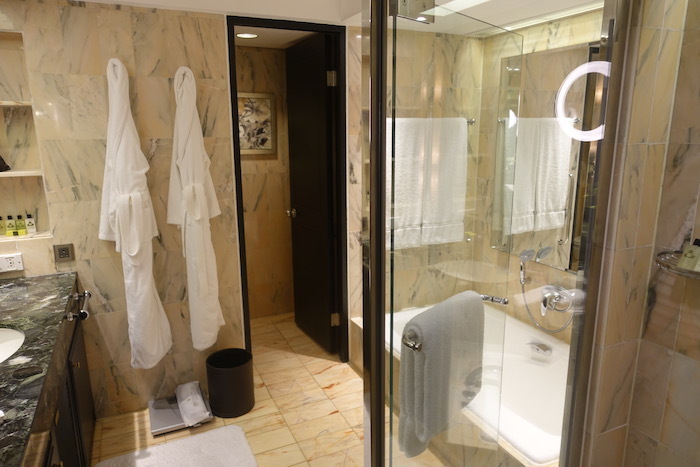 The bathroom was classically elegant, with a sink, tub, walk-in shower, and toilet. However, the toilet felt rather, um, industrial, for a luxury hotel. The toiletries were Agraria branded, and had a nice scent. Now, as I hinted at above, this hotel is all about the views. The InterContinental Hong Kong is right above the Avenue of Stars, along the Kowloon waterfront. The views from these rooms are incredible. Being able to raise your curtains in the morning and wake up to the below view is well worth the upgrade cost, in my opinion. My one slight complaint about the room is that while the wifi was reasonably fast, it kept disconnecting, especially on my phone. I constantly had to reconnect, which was annoying. After a good night of sleep we headed down to the lobby. In case I haven’t made the point clear yet, the InterContinental has incredible views, and that includes from the lobby. 😉 Harbourside Restaurant is located on the ground floor, and then one level above that is the lobby lounge, with live music in the evenings. I also checked out the pool and gym area. The hotel has a pretty nice pool for a city hotel, though there’s construction going on next to the hotel. While the pool doesn’t have views of the harbor, it does face the Peninsula. The best views from the pool deck are from the hot tub, which overlooks the harbor. Unfortunately it was closed for maintenance when we were there, and the water was largely drained. Oh well. The hotel also has an impressive gym. In the morning we were just going to go to Starbucks to grab a coffee, but the nearest Starbucks wasn’t yet open, so we decided to instead have breakfast in the hotel’s restaurant, given that they have an a la carte option (we didn’t want a heavy buffet, especially if we had to pay in cash). I just ordered an omelet and coffee, both of which were great. I spent the morning getting some work done and walking around my favorite city in the world. Then at around 11AM we headed to the airport, so we’d have plenty of time to enjoy Cathay Pacific’s two great first class lounges — The Wing and The Pier. 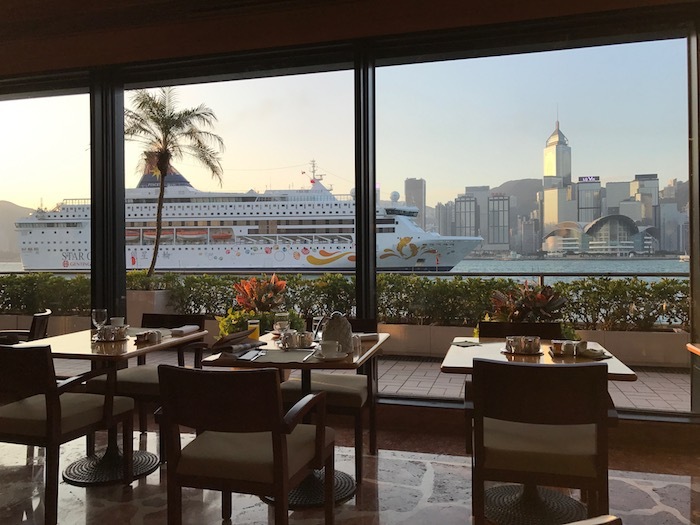 While there are more modern 5-star hotels in Hong Kong, the InterContinental continues to boast the best views available in the city. There are other places I’d rather stay at the hotel’s price point, though all-in I paid $100 for the one night stay, which was an incredible deal. 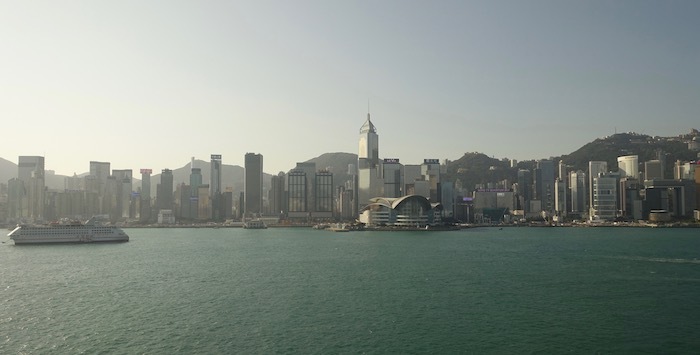 The InterContinental also has an ideal location, as you have easy access to both Kowloon and Hong Kong Island. In a similar situation I’d definitely stay here again. wow good price for the upg, i was offered 700 hkd $90 usd last time from superior to harbour view. In Hong Kong you take a taxi from the airport instead of the super easy, cheap and fast train? You waste a lot of money, and I think you purposefully hide your total travel spend. It has to easily be in the 6 figures each year. $50 to upgrade to harbour view? Bargain… I remember staying here a few years ago on points and we had to pay about $150 a night to upgrade, even though the cash difference between the non-harbour and harbour rooms was about $100, so felt a little robbed, but the view is worth it. 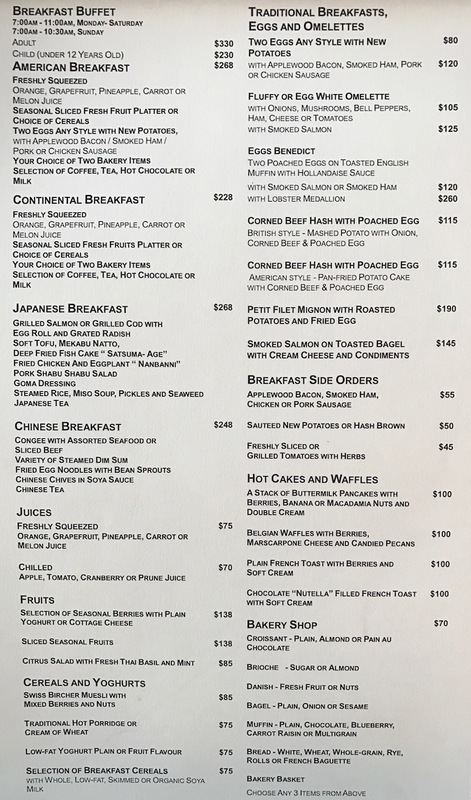 The hotel did have the best and most extensive breakfast buffet that my wife and I have ever seen. It was expensive, but we got 1 free buffet each since our room wasn’t ready when we arrived. @James well the HK Airport express to Kowloon is $90HKG per person, one way. The Kowloon station isnt anywhere near the IC. Transferring to the MTR also doesnt leave you close to the hotel. Given that he was traveling with Ford and that theres not as much traffic late at night, a cab is about $300HKD and not that much more than the Airport Express. And it leaves you at the door of the hotel. 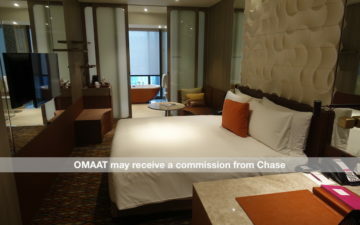 When I stayed as a Platinum Ambassador in 2015, I was quoted 800HKD per night, plus 10% surcharge (so 880HKD/nt) to upgrade from a Superior “Plaza View” Room to Harborview room when staying on points. I was staying 4 nights, so the better view would have totaled 450USD, which I declined. I’m glad (and jealous?) to see they backed it down to something more reasonable. Harbourside has a great brunch buffet on Sundays. I believe it was about 110USD per person for all you can eat and drink. The food was good and the champagne was Perrier Jouet. All in all, I thought it was a good-but-not-great hotel and I’m still confused by what all the fuss is about. It must be that the view I missed is *that* good. Hey Ben is tmobile fast in Hk? You mentioned tmobile>hotel smart phone. Can you do an update on how tmobile has been internationally? I know you talked about tethering not so long ago but I mean more along the lines of google maps and using the internet to look things up and so forth. I highly recommend the Steak-house restaurant located inside the InterContinental Hotel HK. As @Charlie indicated, Yan Toh Heen (the 2 Michelin Star restaurant) is fabulous and one of the best places to have high end dim sum in the city. In terms of originality and taste, I think Yan Toh Heen is even better than Lung King Heen. @James W – what David W said. Especially late at night for two people a taxi is negligibly more expensive than the Airport Express and is way more convenient for a hotel on the Kowloon waterfront. If you are looking at SPG properties the Sheraton across the street (next to the Peninsula) has the same incredible views if you book a club level harbor view room. The main part of the hotel is meh but club level is quite nice. We booked a standard room with points and then contacted the hotel directly for pricing on upgrades to club level and to harbor view. The rooms are on the small side but it looks like that applies to the IC as well. Other than that view, I much prefer staying on Hong Kong Island. I stayed there a few months ago using my free night as well. My “upgraded” room was on the side overlooking the pool and construction site next door. I got lost in the long corridors as well. The restaurant definitely charges expense account prices. I went to the underground shopping area across the street and grabbed some things there for a cheap breakfast. With two people I guess a cab is a little more worthwhile from the airport. I just took the express train and free shuttle bus. Seemed like a relatively quick trip. I had about a 24 hour layover so I think I paid something like $50 for a later checkout of about 5PM. Totally agree with you on the above. It is a great use for the free night cert and it is the location where we use ours 2 years in a row in the past and will use there again this year – because we pass thru HKG (our former home-base) a lot, about 3 times a year. BUT, it is very difficult for us to understand the “ga ga” on the view. May be we are too jaded by it. 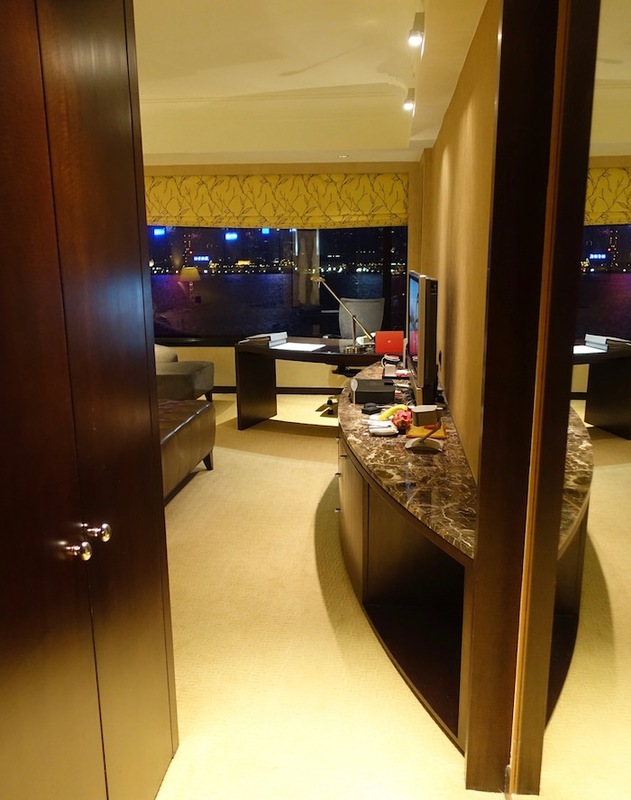 $50 is a good price to upgrade for the view if that is important to a guest but we much prefer a larger room instead – that was what we had in previous stays – some type of Deluxe rooms both were 1/3 or 1/2 larger than the room in the picture. In 2015 we had a very partial harbour view with a bigger size than the room in above picture. In 2016 we had a slightly bigger room with the view described was Pool View yet all it was seen, was the small garden path that would lead to the pool and we did hear some noise from the pool area – but the room was twice as big than the room pictured above. That to us is more important for our stay of 2 nights than a harbour view but standard size room. The MTR to be used should be East TST, all indoor walkway from the street level below the IHG main entrance. It used to be you could walk from the staff entrance to the walkway all under cover but that path was closed probably due to the ongoing construction by the side of IHG. One easy station change at Lai King (the 4th station on the map link below) would get you to the Tung Chung line. Then you ride it to the end terminus of the line, then take a quick S1 bus to the airport. That is how the majority of airport employees make their daily commute. It costs below HKD25 pp. If you are 65 or older, it is a ridiculously cheap HKD4 total. Less than 1 USD! Or you can change to Airport Express at Tsing Yi, one station further from Lai King – that gets you directly to the airport. The whole transportation is often below 45 min. We prefer that far more than a taxi. No time for Valentine’s Day drinks! @JJ Tmobile internationally (outside of Canada/Mexico/US if youre on the right plan) is still just 2G. Sometimes they’ll have a promotion for 4GLTE – they did last summer for a handful of European countries. In HK, it’ll still be slow. It’s perfectly fine for anything that’s just text – emails, texting, messaging apps and in Lucky’s case – uploading text files for the blog. Usually I’ll download offline maps for an area in Google Maps so that it’s ready for me to use. all these may contribute to the low upg price. I was in the area this past October and the tunnels around the area were somewhat confusing. There’s also construction going on, which makes it more complicated. @FLL your method is cheaper but has several connections. For employees that aren’t carrying much, it’s great. For a hotel guest who has bags, it can be a hassle. Furthermore, some of those transfers require a lot of walking. East TST wont get you to Lai King unless you walk all the way to the TST station on the Red Line, which is quite far. You can transfer at Nam Cheong but that’s also quite a walk, if I’m remembering correctly. There are Airport Express buses though and those are fairly inexpensive. Give me a break James. It was late and there was no traffic. A cab is a much better choice and much more convenient in this scenario. Use some common sense and think before you criticize others. I frequently go to Hong Kong and have used both. For those looking for cheap and easy transportation to the IC Hong Kong, I would recommend the airport express bus A21 over the Airport Express train, because it is one mode of transportation and has a stop right in front of the IC Hong Kong (to go back to the airport) and across the street (from the airport, and you can take an underground tunnel to cross the street). It is only 33 HKD one way. I like the airport express train, but the shuttle bus part after arriving at Hong Kong station or Kowloon can be really slow, especially when the hotel is one of the last stops. In the mid-1980s I stayed at a hotel called “New World,” in approximately this location. It was on the waterfront promenade, on the south side of Salisbury Road, so it wasn’t the present hotel called “New World Millennium.” Does anyone know if this is the same hotel that is the Intercontinental today? Thanks for your help. Wow $50 for the upgrade was a deal. I stayed there in October purely because I had IHG points i wanted to use otherwise Kowloon is not my choice for Hong Kong hotels. I did pay for the overpriced upgrade (as Pat mentioned) to a harbor view room as I can’t see the point of being in HKG without that jawdropping view which I never tire of. Bit like the Star Ferry, which is always the first thing I do in HKG while I work out the best way to attack my schedule. The hotel kindly then upgraded me to a massive harbor view suite and frankly I wanted to stay in it for the entire 3 days I was there and never leave. Maybe it was just the comparison coming from European hotels – the space, the view, the luxury were so tangible. I haven’t actually stayed at that property since the days when it opened as a Regent and there were one tenth the number of hotels in HKG from which to choose but very happy I did. The service was unbelievable at every level. Not a thing was unthought of and I was sorry to leave as of course I always am leaving Hong Kong. I think that the hotel is either about to close for a period of time or have a massive renovation in keeping with all the construction in the area which should leave it not just less dated but less physically ‘isolated’ from its surrounds when the new Avenue of The Stars reopens next year. And the perfect Hong Kong exit is the relatively new Qantas First Business One World lounge which is stellar. Get there in time for a Neil Perry inspired evening meal and its lights out as soon as wheels up, arriving Australia in time for breakfast. @Dan T. Nelson – “New World” was a Renaissance Marriott hotel. The lot was empty for a while. They’ve been building a new hotel on the old site. 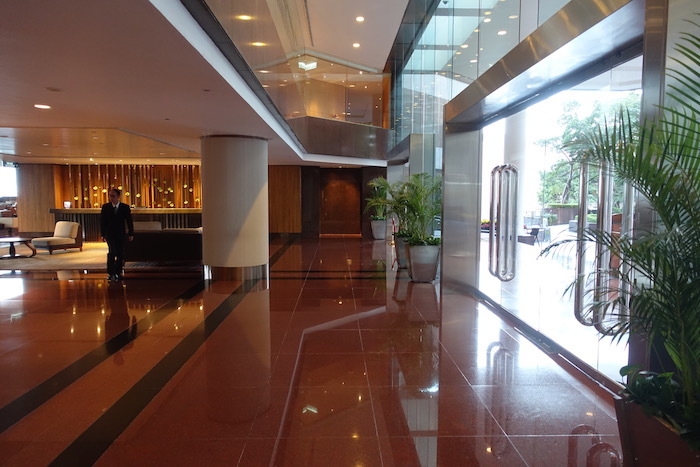 We recently returned from Hong Kong, though we stayed at the two Hyatt’s in HK. I found the free cell phones in the Hyatt’s as well. While I also have T-Mobile, their 2G is pretty slow. What we did was tether to the hotel’s 4G phone while out in the city. Did you use the taxi or train? This hotel is really nice, but a little too far from the subway station if you got bags. I feel you should be telling us how much you are spending on taxi and etc. Especially in HK. The buffet is worth it for the waffles alone. Sunday breakfast buffet has all of the money showing off their exotic cars lined up in front. The steak house is overpriced ($500+USD for some steaks) but worth trying once as you select your knife and have an assortment of salts to try. I agree on the views plus the light show through the hotel room window is great. wow haters are always going to hate. When the train will cost two people HK$180 and doesn’t get you anywhere remotely close to the hotel you are staying. Why not take a taxi when it’s only HK$300. So to put it bluntly, the saving would be quite a bit less than US$20. 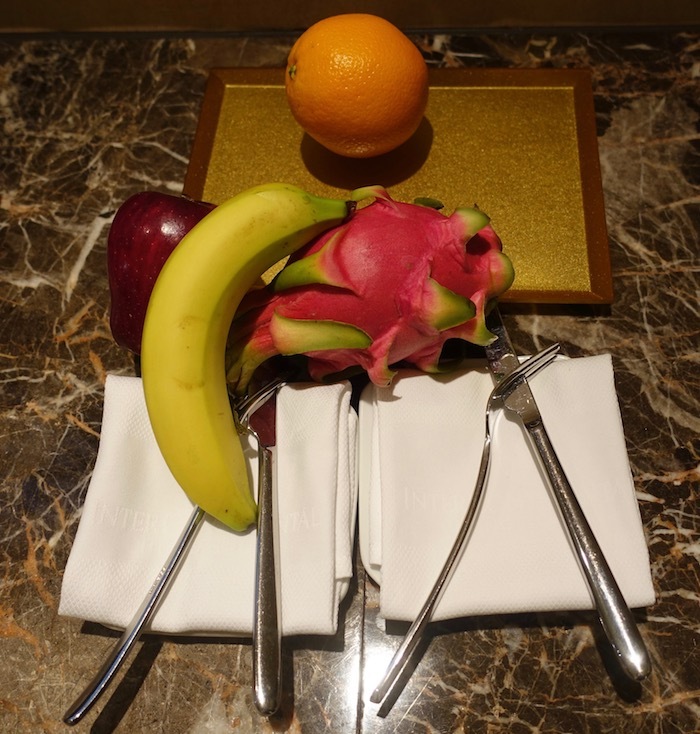 I recommend the IC Singapore for a great use of your free credit card night. We were there in December for a one night layover and thoroughly enjoyed it. The hotel has recently been refurbished. It was still the New World well into the 90s. Also , the Renaissance (Marriott) at Wanchai was developed by the same company and called New World Harbour View before it became Renaissance. IC used to be a bit “precious” . Now it’s just another nice hotel and is less pretentious. We have stayed there for a really special occasion and the staff went out of their way to make our stay really, really special. Upon arrival, fresh fruit, champagne and a birthday cake! The staff were extremely friendly and courteous the entire time we were there. But our room seemed even more luxurious that what you had, the bathroom was larger and had green marble everywhere, and the room was classy and rich! Lots of storage space in the closet leading to the bathroom and the bathroom was at least half the size of the room itself! Had a wonderful dinner at Nobu which was wonderful as usual and enjoyed truly exceptional dim sum at Yan Toh Heen. But what was the best was the view, you just can’t beat the view. I can’t express just how wonderful that particular view is of Hong Kong Island from the Peninsula side. I would return anytime even though there are probably nicer hotels in HK, none have this particular view. Even the Peninsula Hotel doesn’t appear to have this view unless you are on the upper floors facing HK Island. Plus the location is great, walking distance to the best giant shopping mall in Hong Kong at Harbor City, just a short walk to the Star Ferry Pier, and a subway station (East Tsim Sha Tsui Station) right across the street. There is also a Japanese Department Store across the street (SOGO) with a grocery store in the basement so you can pick up food and drinks to bring back to your room. While we went everywhere on the Subway, it is difficult to get to the airport using the subway, having to make a couple of transfers and having to walk long distances with your luggage both through stations and on the street so that would not be the easiest option. All in all we had a wonderful time and glad you and Ford did too! Why on earth would anyone want to know how much Lucky spends on taxis? It really isn’t relevant to anything. But to those criticizing the cab decision? How often do you land at an airport late night, with bags, and feel like taking public transit over a comfortable cab that is taking you right to your hotel door? It’s a taxi, get over it. I dont get whats wrong with taking a cab rather than the train. Secondly, we do know that Lucky likes his little luxuries. Its his money, let him spend it the way he wants. For anyone heading to the IC who is conscious of budget ( if that’s not an obvious contradiction), one alternative is the A21 bus @ about 36 HK$ ( stop at Tsim Sha Tsui East, 2 minute walk), the faster option is the train to Kowloon and transfer to one of the shuttle buses( 95 HK? ).Taxi kicks in with 2 or more or if with a lot of luggage or after hours. “back when I was a Royal Ambassador member with InterContinental, while in this case I was returning as “just” an IHG Platinum member.” to be honest this is the part which interested me the most. I am wondering – could you do a post about statuses that you let go? As far as the taxi vs. train thing goes, there were four of us. A taxi was cheaper. So when do we find out the reason behind this “crazy trip”, as you put it in your first installment? Or are you just crazy and doing trips like this for no reason? The views and the pool are the only reasons to stay at IC. Rooms are not great and service is pretty poor. I stayed twice at the Intercontinental Hong Kong. Both times using my Ambassador weekend 2-4-1 coupon. I included the Lounge access – located on the floor above reception with the same harbor views as the restaurant lobby lounge. Lounge was great for breakfast and early evening beverages and snacks (supper). Always wonderful service. Enjoyed the pool deck and spa (amazing foot massage) even with 90F degrees and 95% humidity. Also visited the clock tower park nearby. A booked deluxe Harborview room gets Ambassador upgrade to Jr Suite room *16 – see floor layout photo above. 2 windows looking out for 270 degree view. 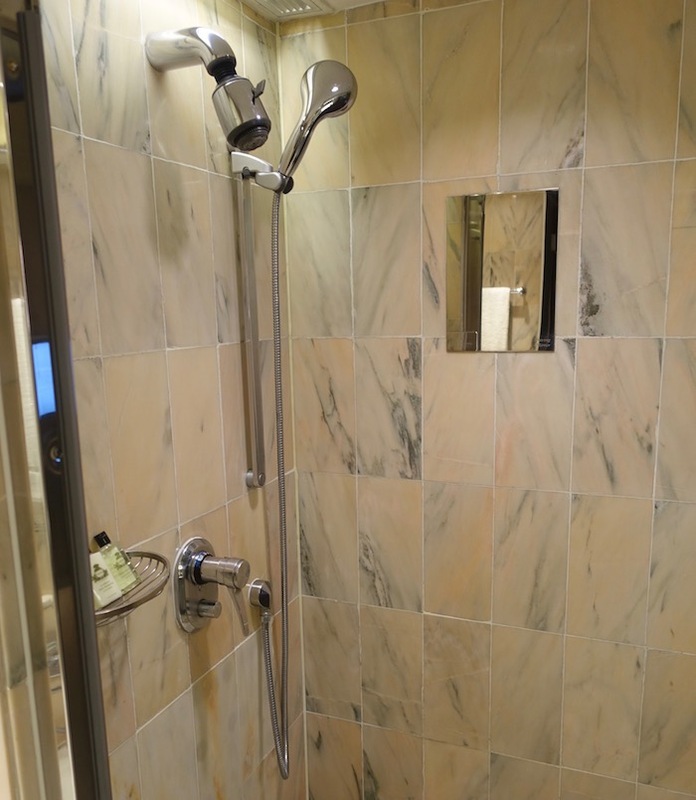 Huge bath with steam shower. Last July I had late check out then off to the cabana at the Wing then 12:30 am flight on my Birthday CX 1st to Frankfurt then several hours at LH 1sT class terminal B4 flight home to Dulles in 1st on B747-8i. I agree that the taxi is a better option, but just FYI, I stayed here for 10 days during the summer break and there was a metro station literally right outside the gate! There’s a little glass structure with an elevator in it, you go down in that, and there’s a metro station. However, since it was raining a lot, we were only able to use it once and used Uber the rest of the times. Even though Uber is banned, they still have great service. They sent Tesla Model S / Alphard / S Class for black which was quite nice. Tried the local taxi once and it was terrible in comparison and the taxi drivers (I’m not blaming them, but it’s just easier on Uber) didn’t speak English while I found most of the Uber drivers to speak at least some amount of English. Availability was great too throughout the city but as you might expect not as good as LA.